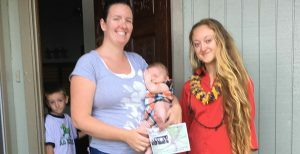 Here are my insights on Jen Ruggles and going door to door with her. Meeting people (her constituents), seeing where and how they live, and experiencing Jen campaigning, were so worthwhile. We get to meet different kinds of people. There are the cynical (have you seen the Matrix? ); the doomsday guy (voting is useless Jesus is coming) ; the conservative who kept harking back to the good ‘ol days. There were those who refused to be bothered and there were those who engaged us. Jen asked each person she talked to about his/her concerns. A nice soft-spoken lady talked about fire ants. Another said robbery is a community concern. A farmer lamented plummeting prices of ginger, papaya, and other traditional island crops. The people that just came home from working in Hilo, complained about the horrible traffic mess. I must say that until you go door-to-door you don’t really get to appreciate a particular place a little bit more. We went to a subdivision in Keaau. I was attracted by the one (1) acre lots fronted by wide paved streets (yes, Virginia, we’re talking about Puna), the generally well-kept yards and home exteriors and the many trees. There were distant ocean views in some places. Jen came upon an old trail she used to run when she was at Keeau High School. There were also lots of walls, fences and gates. Could they be just signs of our increasingly impersonal times or of a crying need for increased vigilance and safety? Jen really likes walking to each house. 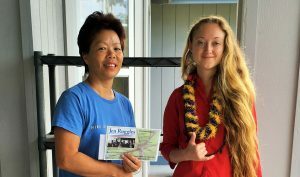 I could feel her strong sense of anticipation as we approached each house with a loud “Aloha” and knocked on the doorl. She is so into it that I pick up on her disappointment when there’s only silence and feel her excitement when we sense that there could be people in the house. Someone once said that our youth today is our hope for the future. Well, there she was. She listened even as she talked. Though soft spoken and still with a hint of timidity natural to youth, she was intently applying her entire being to knowing a community better even as she was making herself known. It is also comforting to know that somebody who cares not just for you and me but also for our Aina, would dare stick her neck (and chin) out and take risks to gain public office. One day while walking to a house, I asked her why she is a candidate. Jen said: “It is as if everything that I’ve been doing all these years has been leading me to this point of wanting to serve more and meaningfully. I would highly encourage anyone wanting to get to know their neighbors more, have fun and educational experience, enjoy the diversity of our community – both in thought and material plane (the variety of building structures is mind blowing!) – and be in the presence of ever so graceful Jen, to walk door-to-door with her. Jen is a truly remarkable, gentle but firm and passion-driven human being that is standing up for us and wants to do what is right for the community. 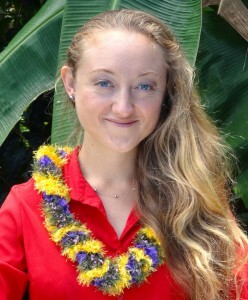 Even more, she really wants to hear what would you like to see happen in Puna. Dream big! What would you like to see materialize? As we put it on the dreaming board we can then take steps and help people in line with our vision get into positions of more power and ability to create new reality for us. Let’s have fun with it!! !